Bacari. These are the typical Venetian cafes, where at the bar or at a small table (there are usually only a few) you can drink an ombra and have a few cicheto (see definition) and ciacola (chat) a lot. The Venetian’s typical habit is to have a quick and tasty break! Cicheti. These are small snacks created according to the host’s imagination. The most typical are made of bread and cod fish spread, a half boiled egg with onion and/or anchovy, a slice of polenta with Venetian sausage, meatballs, etc. Ombra. This is a glass of white or red house wine served at the bar. The name ombra seems to have come from the custom of pouring wine in the shadow (ombra) of the San Marco Bell Tower on market days. Golosessi. These are the sweet alternative to cicheti, the sweets that decorate the shop windows and shelves of the pastry shops. Everyone should try the buranei or the Bussolà di Burano, typical small cakes from Burano Island, and the baicoli, the cookies par excellence of Venice. As a 1-star hotel in Venice, the Hotel Santa Lucia is strategically located, within easy reach of Piazzale Roma thanks to the new Ponte della Costituzione and near the train station. In a peaceful and quiet calle, surrounded by a charming garden, the hotel guarantees your privacy just 3 minutes from the ferry docks. The areas around the hotel are quite lively however, from the Lista di Spagna, the wide calle that becomes Strada Nuova and reaches Rialto, which is full of small souvenir shops and artisan’s stores that those who love shopping will definitely enjoy; to the bacari where you can try cicheti and drink an ombra and renowned pastry shops for a break with typical espresso coffee or hot chocolate (which has been a specialty in Venice since the times of Goldoni) accompanied by golosessi of your choice, including buranei, zaeti, baicoli, pevarini, and sbreghete, which will not disappoint those wanting to discover local specialties. The Hotel Santa Lucia has the advantage, among the other hotels in Venice, to be very near toPalazzo Labia, the magnificent Eighteenth Century residence with frescoes painted by Tiepolo, the great painter of the 1700’s, and also to (a 10 minute walk) the Venice Casino, which is located in Ca’ Vendramin Calergi, the most beautiful building of the 1500’s in Venice. Just beyond another splendid building, there is the Ca’ d’Oro, a flowery gothic Venetian masterpiece. The Ghetto (the ancient Jewish Ghetto), established in the 1500’s, still has a particular charm today, and is only 5 minutes from the Hotel Santa Lucia. For those who prefer not to walk, the vaporetto stop “Ferrovia” is 3 minutes away. From here, line 2 departs, which navigates along the Canal Grande and arrives at the Ponte di Rialto, and in 20 minutes at the stupendous Piazza San Marco. Enjoy your trip! Take the ATVO shuttle or ACTV bus line 5 to Venice/Piazzale Rome (car terminal). From here, cross the new Ponte della Costituzione and pass the train station to Lista di Spagna. Turn left after about 100 meters on Calle della Misericordia where you will find the Hotel Santa Lucia at number 358. Take the shuttle Eurobus ATVO for Venice – Piazzale Roma (car terminal). From here, proceed as described above. From the Venice Santa Lucia Train Station, it is a 3-minute walk to the hotel, stay left and take the calle Lista di Spagna. Go straight for approximately 100 meters and turn left on Calle della Misericordia. The Hotel Santa Lucia is at no. 358. 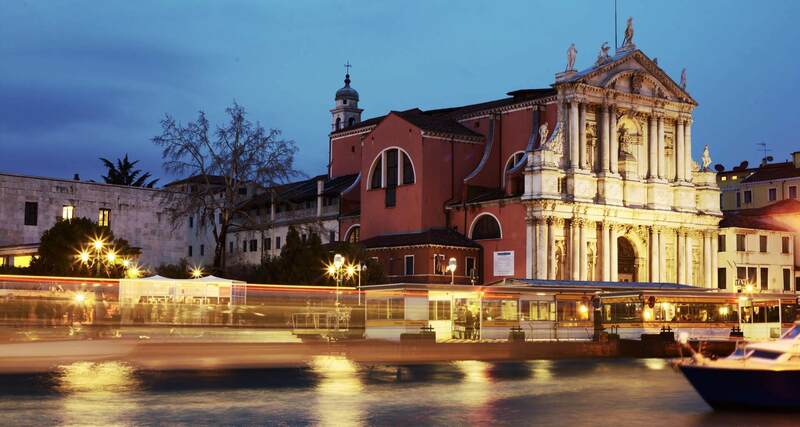 From the super highway, pass through the tollbooths and follow the directions towards Venice. Once you cross the Ponte della Libertà, you are in Piazzale Roma (car terminal) where there are several garages for parking your car (including the San Marco, which has partner prices with the Hotel Santa Lucia!). Another alternative is to park at the Tronchetto, just after the Ponte della Libertà. From Piazzale Roma or Tronchetto, take ferry n.2 heading towards Rialto and get off at the ‘Ferrovia’ stop. From here, follow the directions under ‘By train’. Alternatively, from Piazzale Roma, cross the new Ponte della Costituzione and pass the train station to Lista di Spagna. Turn left after 100 meters on Calle della Misericordia where the Hotel Santa Lucia awaits you at number 358.